One of my recipes is in an iPhone app! It's It's the little things that make blogging exciting and sometimes it's simply being included and delivered on a device that you really, truly love. I've been a devout iPhone user since 2007 and am thrilled to announce that one of my Scrumptious Street recipes is now available on an iPhone app called "Strawberries". The recipe is my fantastic "Arugula and Strawberry Salad with Champagne Vinaigrette" and the Strawberries app was just released for download by the The California Strawberry Commission. I'm pleased and proud to be part of a distinguished group of chefs and food bloggers whose recipes are included in the app. Download and try it out. My recipe is listed as the first one under the Salads section. As As the commission describes in its press release, the app was released "featuring more than 50 mouth-watering strawberry recipes from some of the most popular food bloggers and chefs from around the web. Individually selected for that “wow” factor, these recipes will inspire families, foodies, cooks, the health conscious and strawberry lovers everywhere to get even more creative with strawberries." I'm honored and thrilled to be part of this crowd and hope you'll download the app and give these recipes a try. 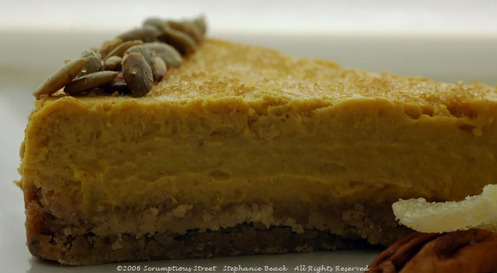 Of course you can share the recipes directly from the app via Facebook, Twitter and email. You can find The California Strawberry Commission's Facebook page at www.facebook.com/castrawberries or Follow them at http://www.Twitter.com/CAstrawberries. have always wanted one and am giddy at the new addition. Santa's helper was also very well-coordinated and encouraged the addition of the pasta roller attachment set for the KitchenAid. I am absolutely thrilled with these new tools, they're so beautiful and feel like such a luxury. 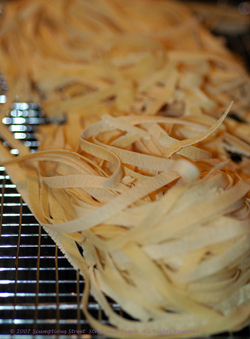 Today, I gave them their maiden voyage and decided it was time to try my hand at making fresh pasta. I had never done it before today. The next thing I'll say is that my first attempt failed for two reasons. Firstly, my dough was too dry and even though I suspected it, I continued on anyway and persevered, figuring it would work itself out. Secondly, I followed the booklet with the pasta attachments and actually used the mixer itself to work the dough the first 3 minutes. I think that was a critical mistake and I could never get the dough right after that. So, while I love, love LOVE my mixer I will boldly recommend this: don't use it to actually mix pasta dough, unless you've done it so much you know how to get it perfect. Even though I was wary of working the dough too much, I think there was just no way to avoid it. I used the paddle hook beater for the first 30 seconds of mixing the eggs and flour and then switched to the dough hook and mixed for 3 minutes. I then pulled it out and started kneading by hand. I kneaded that dough for almost 15 minutes and it was still the consistency of old Play-Doh no matter what I did. So, I chucked that batch in the trash and started over. By hand. Using the old-fashioned well method, much like I did recently for the gnocchi. By the way, gnocchi dough is MUCH easier. 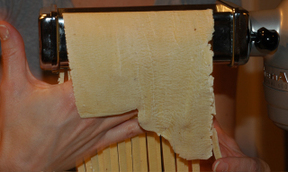 The pasta dough seems more temperamental and is also very intense work in the hands, wrists and forearms. I feel like I developed carpal tunnel syndrome in just one afternoon! Also, I am about 5'5" tall and when I got tired, on my second batch the last 5 minutes of kneading, I actually pulled out a step-stool to get some leverage and body weight into the kneading of the dough. Whew! Chef Batali details his recipe in Molto Italiano, with a decent overview. However, I found that if I literally interpreted his recipe, my dough still had problems. So, I adjusted the recipe by including an additional egg and I added a little fresh black pepper for more flavor. When it came to rolling out the dough, I followed his basic advice but again, developed my own rhythm and repetitions for sending the dough through the rollers. 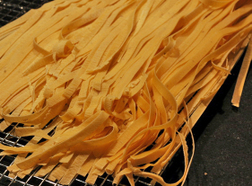 Regardless, if you make fresh pasta for the first time prepare yourself for a learning experience and that you'll probably waste a lot of dough. As you know I completely tossed out my first batch. On my second batch, I probably only got good fettuccine out of half the dough and the other half either tore, wrinkled, ripped apart or had some other handling or thiness/rolling issue. But, the next time I make it, I will definitely know what I'm doing! So, in the successful method I did it all by hand up until rolling the dough and then, I used the stand mixer and pasta attachments. The attachments are FANTASTIC, by the way. Here was my recipe, adapted from Mario Batali. Be aware that humidity, your flour and the size and quality of your eggs will really affect the dough. You may use anywhere from 4-6 eggs for this, if you find the dough is still crumbling apart when you try to begin kneading with your hands, form the well again and add another egg. 1. 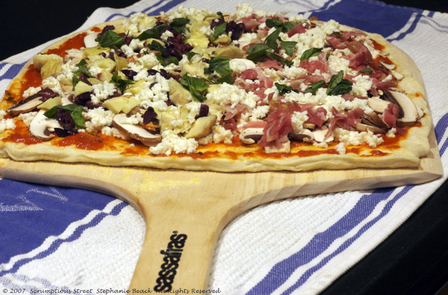 Mound the flour in the center of a large wooden board or non-stick countertop. Make a well in the center and crack the eggs into the well. Beat the eggs together with a fork. Add the black pepper to the eggs and beat with the fork again. Now, begin to incorporate the flour, starting with the inner rim of the well. As you pull more flour into the center well, keep pushing the flour up around the outside to retail the well shape. Think of it as making a fortress and you're building from the inside. When half the dough is incorporated the dough will begin to come together. Start kneading the dough, using primarily the palms of your hands. If the dough keeps breaking apart or flaking apart, you may need to add another egg. If you do that, make a well again! Beat the egg with a fork again, like the first time. The well method is crucial to getting a little bit of the egg into the flour or dough at a time. Thus, the reason I don't think a mixer can do it as good as the ol' hands. 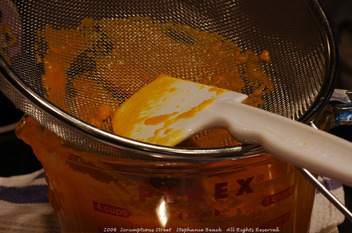 Once the dough is a cohesive mass, set the dough aside and scrape up and discard any dried bits of dough. 2. Lightly flour your work surface and continue kneading for at least 10 minutes, dusting the surface with a little bit of flour as necessary. The dough should be pretty firm and elastic most of the time. When you finally have it in one nice ball that is quite elastic, wrap the dough in plastic wrap and allow it to rest for 30 minutes at room temperature. This resting is critical, when you unwrap it the dough will have softened and that is what you want. Do not knead it back into tension before rolling out. You need it somewhat soft. 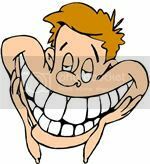 If after 30 minutes, it still feels very tight, cover again and wait another 15-20 minutes. 3. 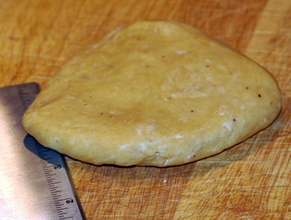 Cut the dough into 4 pieces and wrap three of them again in plastic. Flatten the piece of dough into a burger shape that is somewhat thicker in the middle and about 1/4 inch thick at the edges. 4. 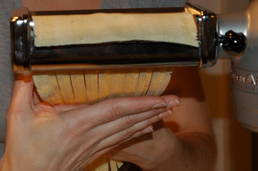 Set the flat pasta roller attachment to the widest setting and dust rollers with a little flour to make sure the dough won't stick. Do not use more flour as you go along unless you dough does stick. If you use too much flour, the pasta will become too dry. 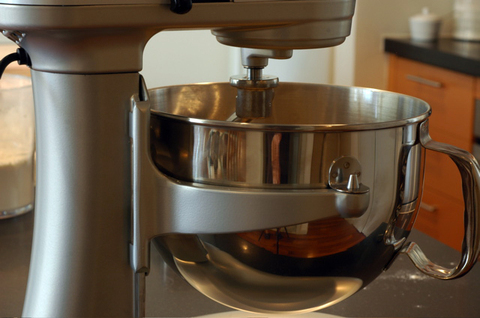 Fire up the mixer and get the rollers cranking and begin feeding the dough into the slot between the rollers. For me, it worked best to feed in the top with my left hand and catch the dough from the underside of the rollers in the palm my right hand. Make sure you don't tear it and don't pull the dough through. You also may have to pinch it at the top to get it thin enough to continue through the rollers. Too thick and it'll go nowhere. Fold the dough in thirds, flatten it with your palms and roll it out again. Repeat this process 5 times, then set the rollers to the next-thinnest setting and repeat about 6 times again on that setting. Here's another place I diverged from the recipe. It encourages the folding between each repetition. I found that my dough was destroyed by the time I got through to the thinnest settings if I folded so much. So, after getting the hang of it, I settled on folding just the first couple times through and then every other time, it fit perfectly in the rollers and I just shipped it through each time. You will have to experiment with your own rhythm and reps. Also, as I fed the dough in the top once it started going I folded it over the backside of the attachment as you see in the photos. This helped keep it aligned and "between the rails" if you will. Otherwise, it would get crooked and then wrinkle and tear. 6. Trim the dough sheets to have even, uniform edges and let them dry on cooling racks or over the back of chairs, aerating the sheets as they dry. 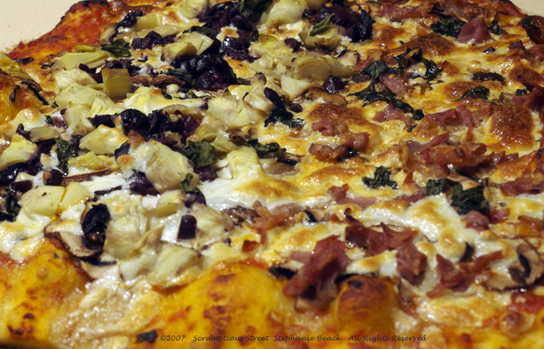 Continue the steps above for the remaining three quadrants of dough that you originally divided. 7. When the dough is all rolled and dried, attach the fettuccine cutter attachment to your mixer and send each sheet through the cutter, catching it delicately with one hand as you feed it through with the other. Again, let the uncut portion lie over the back of the attachment for alignment and less pressure on the dough. 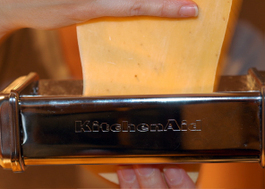 If you don't have the cutter attachment, you can brush your sheets of pasta lightly with flour, roll them up and use a sharp knife to cut them into 1/4 inch wide strips. 8. After all the pasta has been cut, spread it out on the racks to dry a little more and gently bend them into a u-shape so that when you cook them, they don't snap in half. It a was tiring and fascinating experience, I haven't learned so much from trial and error in the kitchen in a very long time. But, ultimately, it was so much fun! Sitting here tonight, however, my forearms and wrists are positively aching. No wonder those Italian women have such thick and strong forearms! Next post, I'll show you how I cooked the pasta...it was worth ALL the work and turned out exquisitely. I've recently purchased the most incredible steamer basket and pot from a fabulous Thai grocery store in Chinatown, shown in the photo above. I have used it to make sticky rice, and the texture, form and moisture is unbelievable. Steaming in bamboo also creates a gorgeous taste that is so authentic and mixes nicely with whatever you do to liven in up. I won't share my favorite recipe with you now because it's not my own. I am a tester for the James Beard 2006 award winner for Internet Website for Food, Leite's Culinaria, and I tested it for them. I won't share it until well after they've published it. But, when they have I will point you to it because it is divine! As you know by now, I am truly thrilled by the process and results of cooking with professional appliances at home for the first time. 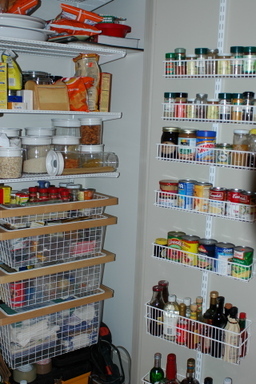 One of the joys in my life is the additional storage of my new kitchen, including a fantastic pantry installed by my dear husband in one of our "spare" closets. For all you New Yorkers, yes, that's how unique our new apartment is. 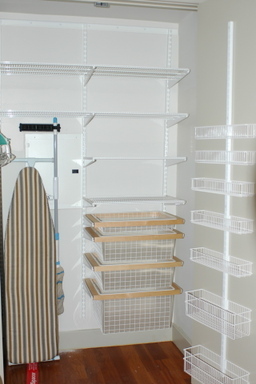 <HUGE GRIN ON MY FACE>There is so much closet space we have turned one into a pantry.</HUGE GRIN ON MY FACE>. Check it out right after he built it, when we moved in. And, here's what it looks like now, after getting settled and cooking all the time. Yes, it's partially a garage too, we didn't buy a HOUSE, afterall. The fantastic steamer helps me create beautiful sticky rice and I have the steamer because of my gorgeously spacious pantry! It's all so completely exciting, I feel like a little kid who finally got a pony at Christmas after years of getting only sweaters. I used to have the three-tiered bamboo steamer for vegetables and dim sum but I find this Thai variation is perfect for the rice, specifically. 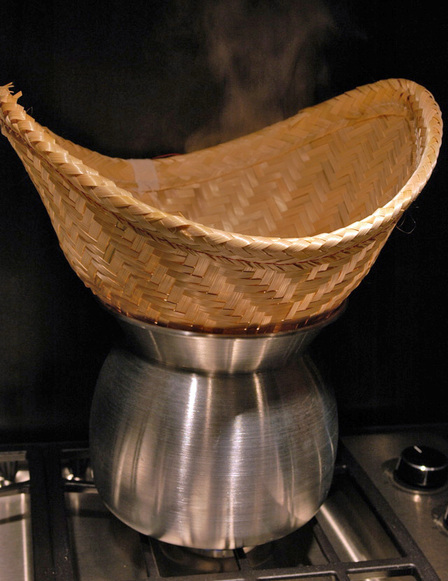 So-- how many of you already know and love bamboo steamers and have you used this particular Thai variation?